Wait, this is supposed to avoid detection!? 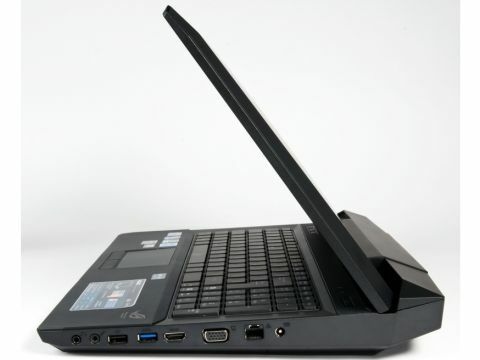 Over the past twelve months we've seen a range of 3D-capable laptops released by some of world's biggest manufacturers. As well as the polarised screen technology of the Acer Aspire 5738DZG, the Nvidia 3D Vision based Toshiba Satellite A665-11Z and the ATI HD3D-powered HP Envy 17 3D, Asus was one of the first to get in on the act with the release of the Asus G51J at the start of the year – the world's first 3D laptop to use active shutter 3D glasses. The Taiwanese manufacturer has now stepped back into the 3D market with the uniquely eye-catching Asus G53Jw. Designed to combine the distinctive Stealth Bomber style of Asus' high-powered G73Jh gaming laptop and the 3D screen of the aforementioned G51J, the Asus G53Jw packs cutting-edge technology across the board. Aiming to deliver one of the most feature-packed specifications yet seen in the desktop replacement laptop market, while also providing high-powered gaming performance and 3D capabilities, the Asus G53Jw has the potential to be the world's greatest 3D laptop, but only if it learns from the flaws of previous 3D machines and fixes the most common faults we've seen many times before. Unfortunately, while the Asus G53Jw succeeds greatly in some areas, it falls flat in others, making it as much of a mixed bag as every other 3D laptop we've seen to date. With that said, however, there's no denying the stunning combination of both style and substance on offer and, while the Asus G53Jw is not quite the market-redefining gaming laptop we had hoped for, it is certainly one of the better 3D machines you can currently buy – albeit one with some notable flaws.